As if Kinect is spewing paint into the 3d-reconstructed room. Moving the HMD results in a paint-splattering, spin-art effect on the monitor. Made in XNA starting with the tutorial here. 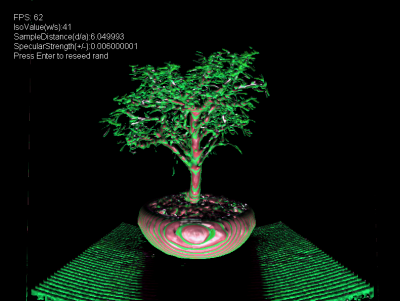 A bonsai tree with an exotic transfer function. interpolated across the entire volume.